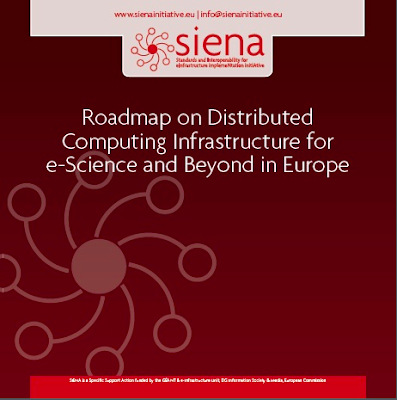 The last version of the Roadmap on Distributed Computing Infrastructure for e-Science and Beyond in Europe was released last week by the SIENA initiative. The main open-source cloud computing projects, like OpenNebula, and standards bodies, like DMTF, OASIS, OGF, ETSI, and SNIA, have contributed to this roadmap that assesses the situation, identifies issues, and makes recommendations regarding the adoption and evolution of open standards-based interoperable grid and cloud computing infrastructure (e-infrastructure) or to support research in Europe. As member of its Editorial Board, I recommend to use this roadmap as a reference of the work in cloud standards being developed by the large number of standards bodies and other collaborative groups. I hope this roadmap is a first step to achieve a closer collaboration between them to avoid the existing situation where different working groups are covering the same functionality and needs. As it was pointed out in the Workshop Towards a Cloud Computing Strategy for Europe: Matching Supply and Demand organized at the 1st Digital Agenda Assembly, one of the main barriers to cloud computing adoption is interoperability and portability across cloud providers and products. This is needed to avoid vendor lock-in and create a healthy competitive cloud computing market in Europe. The roadmap was presented at Cloudscape IV Advances in Interoperability and Cloud Computing Standards, the 23rd of February in Brussels, including presentations from key stakeholders. One very interesting conclusion of the workshop is how open-source is driving forward development and adoption of standards in cloud computing. Most of the initiatives in research infrastructures that were presented during the event are using OpenNebula as vendor-agnostic open platform for building and managing their cloud, and its interfaces are evolving into the standard in this area.